I have heard countless friends’ and strangers’ state that they cannot wait for November 8th, just because we can finally be free of these intrusive campaign approaches. Well, I’m here to tell you, it’s finally time. No more build-up, today is the day (If you haven’t done so already, be sure to get out there and rock the vote). That being said, a lot of the initiatives utilized to motivate voters, also have merit in the learning realm. Specifically, a lot of research goes into calibrating a well-oiled campaign. Both sides know that there is a threshold of what they can provide to their prospective voters without disengaging them, as well as a wide variety of approaches in which their potential voters can be reached. 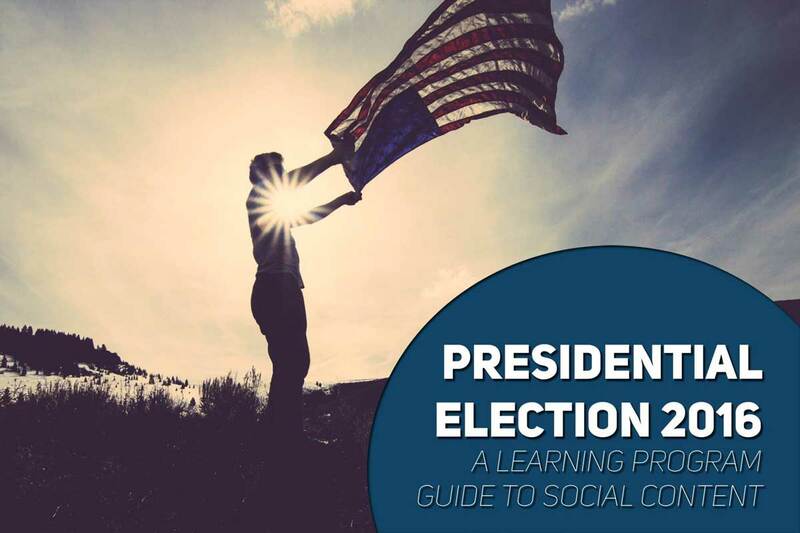 As learning professionals, the election is a large tutorial on how to motivate learners to undergo organizational learning at a reasonable pace. Instead of ensuring the success of a country, our focus is strictly on programs and the utilization of proven techniques. Advertisements may not be the best way to remind your organization of due-dates (Although, they could work to some extent). However, a few of the other methods utilized which are a little less intrusive could work wonders for your program. In order to provide a thorough campaign platform, I’ve opted into solely discussing innovative approaches parties are taking in the realm of social media. Normally, the eighth day of a month would come and go without much thought. But people from all over the US have had this date circled on their calendar for years. This may be the first day of the year that some of your friends who are really bad at acknowledging dates actually know what the date is. Granted the external drive for knowing this date may exceed that of the social media efforts utilized to inform of when people should show up. But the reminders definitely help. The same rings true for your learning program, whether it be within private social groups on LinkedIn or even a company’s Intranet, constant and persistent engaging reminders can make the difference between a low engagement of a learning object, and fully taking advantage of the learning itself. Reminders are not the only way in which to inform learners about what is going on within your program. Use learnings as a stepping stone and initialize discussion based on learning topics via private social media channels (Protected Groups). This will not only further facilitate learner engagement but also bring attention to learning efforts. This has been effectively utilized in the presidential campaigns in a public forum by instilling a FOMO (Fear of Missing Out). FOMO is a powerful tool for learning engagement as it allows program organizers the ability to project a needs based urgency to learners organization-wide. Perhaps the simplest form of badging exists in the voting world. A small sticker emblazoned with “I Voted Today”, or another similar moniker adorns users across a wide variety of social media today. Additional badging efforts have been included in campaigns from an early go this election period. “I’m with her” and “Make America Great Again” social media badges have been highly visible and effective marketing efforts for both candidates. Similar efforts can also work for your learners. Badging is a wide-ranging field that can be specifically addressed within learning or merely within the functioning of the LMS itself. Imagine your learners displaying proud badges of time spent within their learning environment, and what effect that may have directly on their co-workers. Badges are powerful and highly adaptive tools that can lead to the additional motivation of users within a system. This campaign season has been a wealth of knowledge in terms of utilization of unconventional voter commitment methodologies. Some of these methods are very significant from a social media standpoint. These are highlighted above as reminders, engagement strategies, and badging. When considering expanding the reach and capabilities of your learning program, do not neglect these capabilities. Beyond these initiatives, the most important takeaway is: Make sure you vote! (If you haven’t done so already). As always, thank you for joining us here at the Gyrus Blog, be sure to subscribe at the top right-hand corner of this page (Bottom if you are viewing this via a mobile platform), in order to get this fresh content distributed directly to your email inbox as it is posted. As well as follow us on social media for new content, product news, and interaction directly from Gyrus.